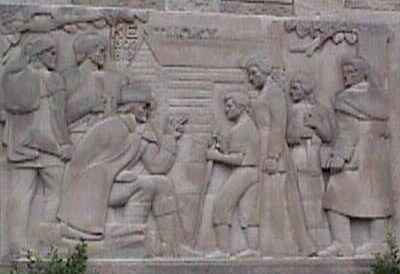 This is the first of five sculpted limestone panels in the cloister wall at the Lincoln Boyhood National Memorial. Sculptor E.H. Daniels depicts Abraham Lincoln's years in Kentucky (1809-1816), showing him in the middle as how he might have looked as a seven-year-old. From left to right: Jesse LaFollette, Thomas Lincoln, Dr. Christopher Columbus Graham, Nancy Hanks Lincoln, Sarah Lincoln, and Caleb Hazel.